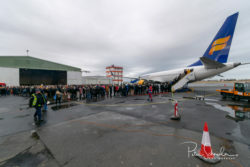 A huge crowd gathered to come see Icelandair’s newest addition to its fleet. 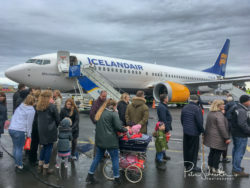 During a recent trip in April to Switzerland, I was able to make use of Icelandair’s Stopover option #MyStopover, and spent a weekend in Reykjavik to attend an employee-only plane warming party for the first Boeing 737 MAX 8 added to Icelandair’s fleet. 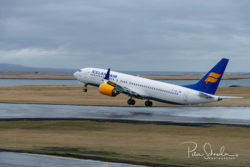 In February and March, Icelandair took delivery of their first three Boeing 737MAX 8 aircraft, TF-ICE, TF-ICY, and TF-ICU. The airline has 13 more MAX-series jets on order, with the next three scheduled for delivery in 2019, with the final delivery of this order slated for 2021. 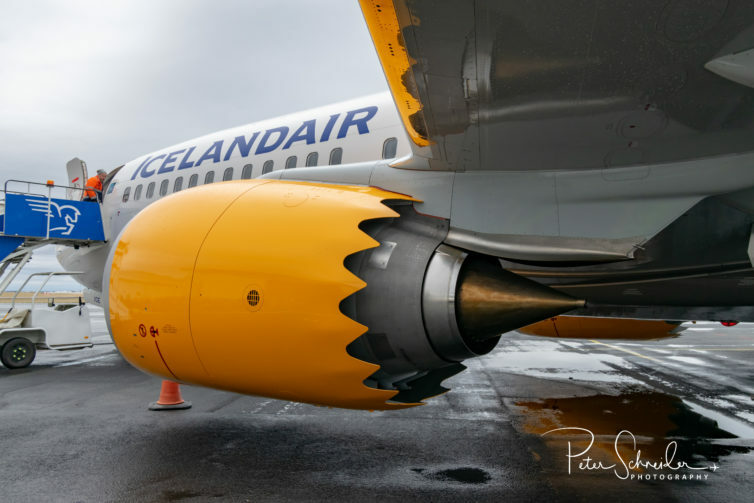 The 737MAX features Icelandair’s updated livery, which has a simpler look. The blue is a lighter hue, the underbelly is grey, the words on the tail have been omitted so it only has the logo, and the yellow fuselage stripe has been removed. 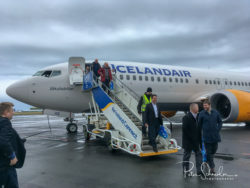 The aircraft were delivered without seats — they and the in-flight entertainment system were installed in Keflavik by Icelandair Technical Services. 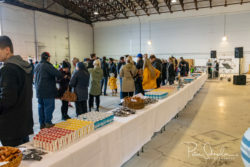 There was a several-day delay, before the first scheduled revenue flight, but, very quietly on April 13, TF-ICE made its first revenue flight to New York (EWR) and back, just in time for the party. 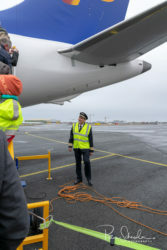 On the morning of Saturday April 14, TF-ICE made a quick repositioning flight from Keflavik (KEF) to Reykjavik City Airport (BIRK), where Icelandair’s upper management, along with some lucky employees, invited guests, and members of the press were about to board this brand new Boeing 737MAX for a sightseeing flight over Iceland. 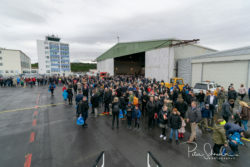 TF-ICE took to the skies at 11:21 a.m., heading towards the interior of the country before heading up to Akureyri for a fly-by of the airport to honor the birthplace of Flugfélag Akureyrar back in 1937, which today is Icelandair. 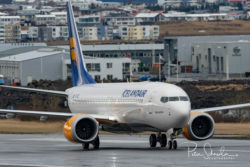 Icelandair CEO and President Bjorgolfur Johannsson’s hometown of Grenivík was circled (he was onboard the flight), before heading back to Reykjavik. The party was about to get started. While TF-ICE was underway, the preparations were in full swing on the ground. 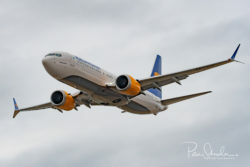 Icelandair had invited its employees along with family to come check out the newest addition to the Icelandair fleet. 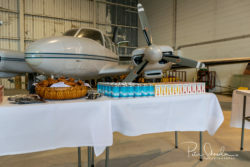 Eagle Air’s hangar was set up for some food, fun and entertainment. The word went around the organizers had planned with about 700-800 people for the event, but apparently nearly 2,000 people RSVPd. So a second food truck was organized to make sure enough food was at hand. 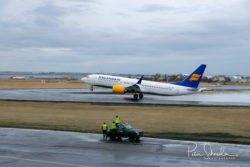 Icelandair organized media access to the old tower at the Reykjavik Airport. It features a nice balcony that provided a superb view of the runway. Two fire trucks got in place for a water cannon salute, and the return of TF-ICE was only minutes away. 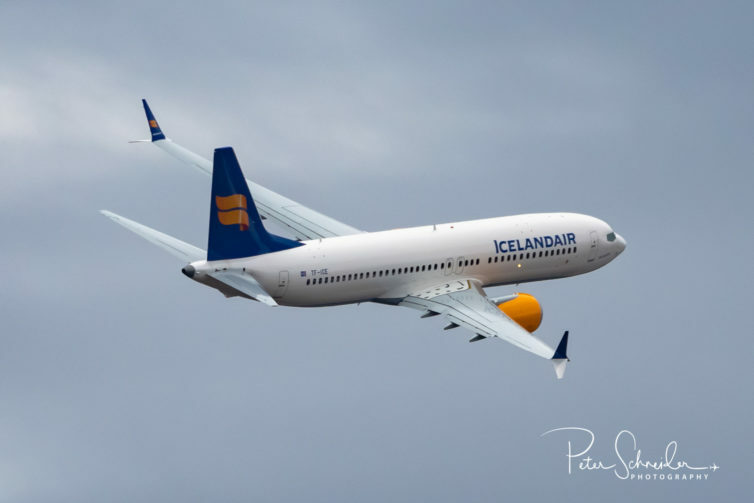 As the plane returned from its sightseeing flight, it came in over downtown Reykjavik and then did a low flyby over the runway. At 12.44 p.m., after a one hour and 23 min. 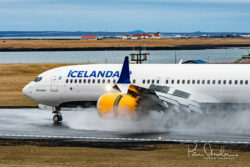 flight, TF-ICE, which is named Jökullsárlón (a glacier lagoon) touched down at Reykjavik airport. The crowd was standing in a half circle in front of the Eagle Air hangar awaiting the water cannon salute. 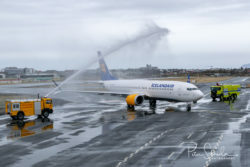 TF-ICE back taxied on the runway and as it got into position for the salute, only one of the fire engines ended up discharging water for the salute — it appeared that the other fire engine had an issue with its water cannon. It still was a nice welcome. 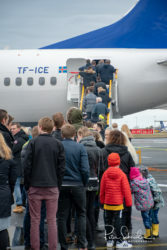 TF-ICE took up its parking spot, air stairs were pulled up to the jet and the lucky participants of the scenic flight deplaned with big smiles on their faces into the waiting crowd on the ground. 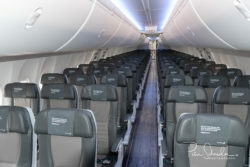 Maintenance crews quickly laid down some plastic covering onto the carpet in the aisle of the plane, as there were about a lot of people to walk down the aisle to get a glimpse of the interior of this new Boeing 737 MAX. A long line formed, and everyone patiently awaited their turn to get on board and be able to have a look. 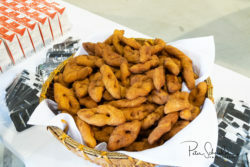 The food trucks were cranking out burgers and pizza, beverages and Kleina, the Icelandic mini-doughnuts were available inside the hangar. 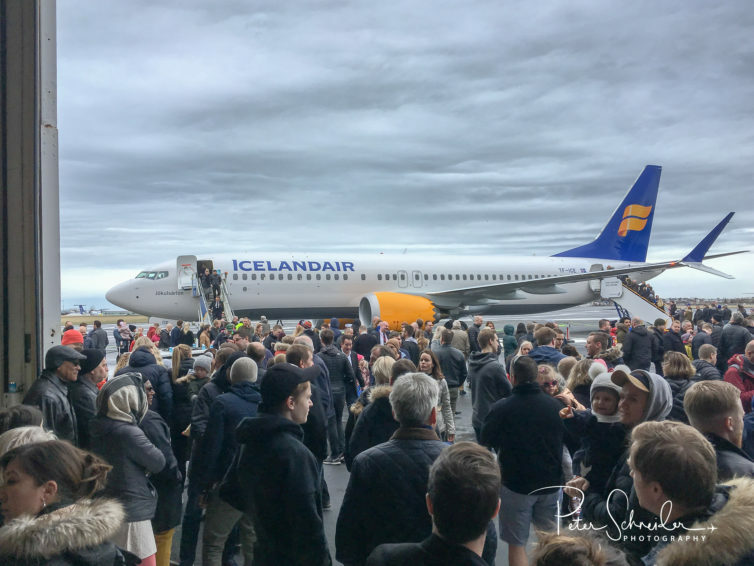 Icelandair made sure the youngest visitors were well taken care of — they hired a musician who sang and danced. 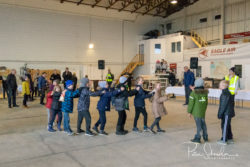 It was very heartwarming to hear the kids singing inside the hangar. 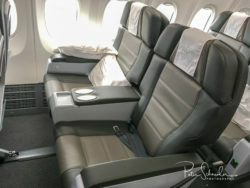 I was able to have a look at the interior of the jet right after the scenic flight, while the maintenance crew were installing the carpet covers. I also walked through the aircraft again at the very end of the event with the very last visitors. 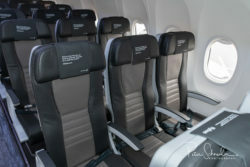 Icelandair uses seats from Avio Interiors out of Italy. The aircraft features 160 seats in economy (3+3 abreast), with 16 seats in Saga class arranged 2 + 2 abreast, which is their premium product. The 737 MAX features Boeing’ Sky Interior with LED mood lighting and large overhead bins. The new Boeing 737 Max 8 features “Advanced Technology” split-tip winglets for improved aerodynamics and CFM International LEAP-1B engines, which contribute to about a 14% reduction in fuel burn compared to a 737NG. 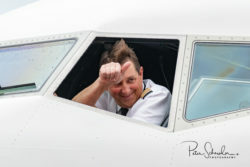 The pilots told me that they were impressed with the performance of the 737 MAX. As the event started to wind down, the last few people made their way up the stairs to go have a look at the interior. 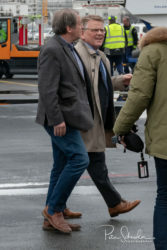 Captain Hjálmarsson did a pre-flight walk around while posing a for a few pictures. A fair number of attendees stuck around to watch the departure. Many pitched in to help clean up inside the hangar while the ground crew readied the jet for departure. 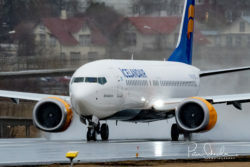 Shortly after 3 p.m., the LEAP-1B engines roared to life, and captains Hjálmarsson and Baldursson taxied the jet down the taxiway before turning onto runway 19. The engines spooled up, lots of moisture got kicked up, and TF-ICE leaped off the ground in no time for its short repositioning flight back to Keflavik. 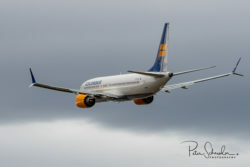 The post Icelandair to the MAX! appeared first on AirlineReporter.